The two-time Super Bowl winner is looking to sign a contract extension before Week 1. 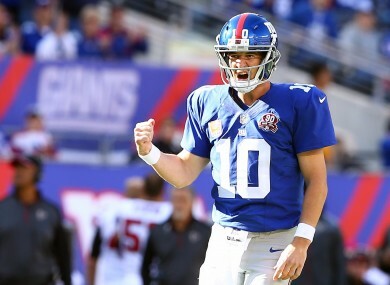 IT’S BEEN QUITE the off-season for quarterbacks in search of contract extensions, and now Eli Manning wants to join the party and get paid. According to NFL Network’s Ian Rapoport, the two-time Super Bowl winner is looking to sign a contract extension before Week 1 that will make him the highest-paid player in the NFL. Aaron Rodgers currently has the highest average annual salary at $22.0 million per year. As it stands, Manning will make $17 million in the final year of his contract before becoming an free agent next season. With Philip Rivers recently renegotiating his contract with the Chargers so that he will make a whopping $65m in guaranteed money as part of his new 4-year, $83m deal, and Ben Roethlisberger receiving a 4-year, $87.4m extension back in March, it’s understandable that Manning feels he deserves a big payday. All three quarterbacks are members of the 2004 draft class, and these recent contracts are undoubtedly influencing Manning’s request for a big extension. Considering the dearth of legitimate quarterback talent around the league, the Giants will be happy to overpay him. The question is how much. Rapoport reported that there is still a “significant gap” between what Manning wants and what the Giants are offering. With less than a month until the Giants kick off their season against Dallas on September 13, both sides will likely figure out a way to front load a new contract for Manning, or give him a ton of guaranteed money, so that Manning can technically say he’s the highest paid quarterback even though his salary won’t really come close to the yearly salary of Aaron Rodgers. The question, as always, will be if a big contract extension will translate into on-field success. Manning and the Giants have shocked the world twice before, but this season they’re just a borderline playoff team. Are issues with Keane part of the reason behind Delaney’s absence from the Irish squad? Email “Eli Manning wants the highest salary in NFL history”. Feedback on “Eli Manning wants the highest salary in NFL history”.